Wyant Morton, chair of Cal Lutheran’s Music Department, founded Areté Vocal Ensemble with the goal of performing the widest possible vocal repertoire, including works from essentially all periods. (THOUSAND OAKS, Calif. – Oct. 25, 2018)Areté Vocal Ensemble is marking the start of its 10th season by performing the music of several living California composers. The concert will begin at 2 p.m. Sunday, Nov. 11, in Samuelson Chapel at California Lutheran University in Thousand Oaks. The program will feature pieces by contemporary composers John Adams, Jenni Brandon, Ross Care, Gabriel Kahane, Shawn Kirchner, Morten Lauridsen, Dale Trumbore and Eric Whitacre. Wyant Morton, chair of Cal Lutheran’s Music Department, founded the professional ensemble of vocal artists with the goal of performing the widest possible vocal repertoire, including works from essentially all periods. Special attention is given to contemporary, experimental, improvisatory, crossover and ethnic music. The ensemble, which takes its name from the Greek word for excellence, is based at Cal Lutheran. 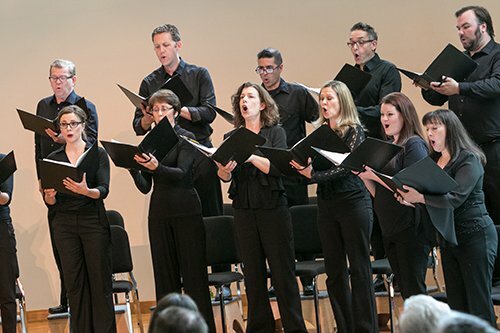 Morton, a Thousand Oaks resident who has conducted Cal Lutheran’s choral ensembles since he joined the faculty in 1992, had an idea of the local music industry professionals he thought would be interested in performing with Arete when he started the ensemble, and those people did indeed form the original group. Six have been with Arete since the first concert --- Scott Brodie of Moorpark, Kevin Droney of Westlake Village, John and Kathy Josselyn and Debbie Schaeffer of Thousand Oaks, and Jeff Shaner of Simi Valley. “The surprise has been how it has spread,” said Morton, who conducts the concerts. Many members who have joined since then are professionals who contacted him after hearing about the ensemble upon moving to Los Angeles. Current members come from throughout the region stretching from downtown Los Angeles to Ojai. The number of Cal Lutheran alumni in the group, which ranges in size from 24 to 32 singers, has grown as Morton’s former students decide they want to perform professionally after graduation. Most of the current eight alumni members have graduated in the last decade. Arete’s performances have drawn new people to campus beyond the faithful followers of the university’s student ensembles, some traveling from Orange County and Santa Barbara. Several years ago, Areté started collaborating with other arts organizations. The New West Symphony has been its most frequent partner, inviting Arete to serve as the chorus for orchestral works during its concerts. The chapel is located at 165 Chapel Lane. Tickets are $20 at the door and $15 purchased online in advance. Student tickets are $10 with ID. Children under 12 are free. For more information or to purchase tickets, visit aretevocalensemble.org.